My children would love to earn their own money. I haven't provided ways for them to do that, simply because I wasn't sure what to tell them until they were old enough to babysit. I have one child who has been interested in earning her own money for several years, and I have not known how to guide her in that process. I jumped at the chance to review curriculum from Micro Business for Teens, aimed at children ages 10-18, hoping it would help us both with ideas for getting started and staying in business. The author, Carol Topp, is a CPA, and helps people start their own businesses. She put this curriculum together because she found the books available on the topic for kids were either too childish, too focused on entrepreneurship, or were adult books "repackaged" and sometimes unrealistic for teens. The curriculum includes three books: Starting a Micro Business, Running a Micro Business, and Micro Business for Teens Workbook. We received a printed copy of each book to review. The first book, Starting a Micro Business, takes you through what a micro business is, and what it is not. I was delighted to learn that it is NOT an entrepreneurship - no one has to come up with a brand new idea. You work with what you already know how to do. The book takes you through the steps of creating your own micro business, gives LOTS of ideas for possible businesses, discusses potential problems and pitfalls, writing a business plan, financing (no debt! ), and encouragement for how to keep going with your business. The second book, Running a Micro Business, teaches the nitty-gritty of what needs to happen to have your business make money: sales, marketing, and customer service. It also discusses keeping track of your money: record keeping, bookkeeping with examples of a simple way to do that, and whether or not you might want to use personal finance software or accounting software for your business. You will also learn about legal issues, such as whether you need to register a name for your business and if you need a tax ID number or insurance. Finally, you will learn about TIME MANAGEMENT, which might just be the most important part of the course! 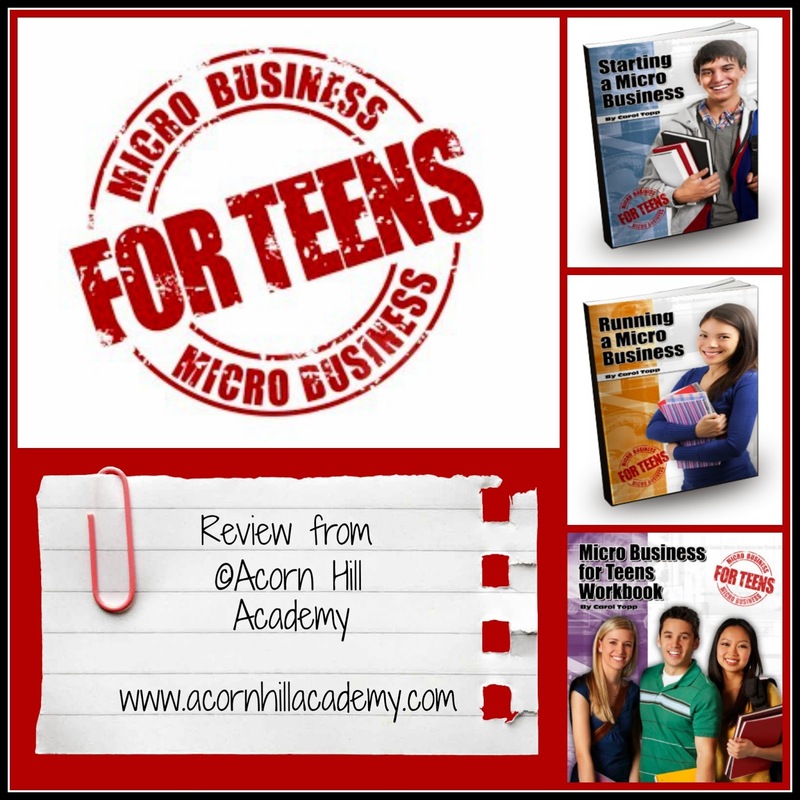 The Micro Business for Teens Workbook is a great way for a teen to work through the ideas presented in the books on starting and running a micro business. My oldest daughter likes to think things through on her own, so she took the books and workbook and went through them on her own. 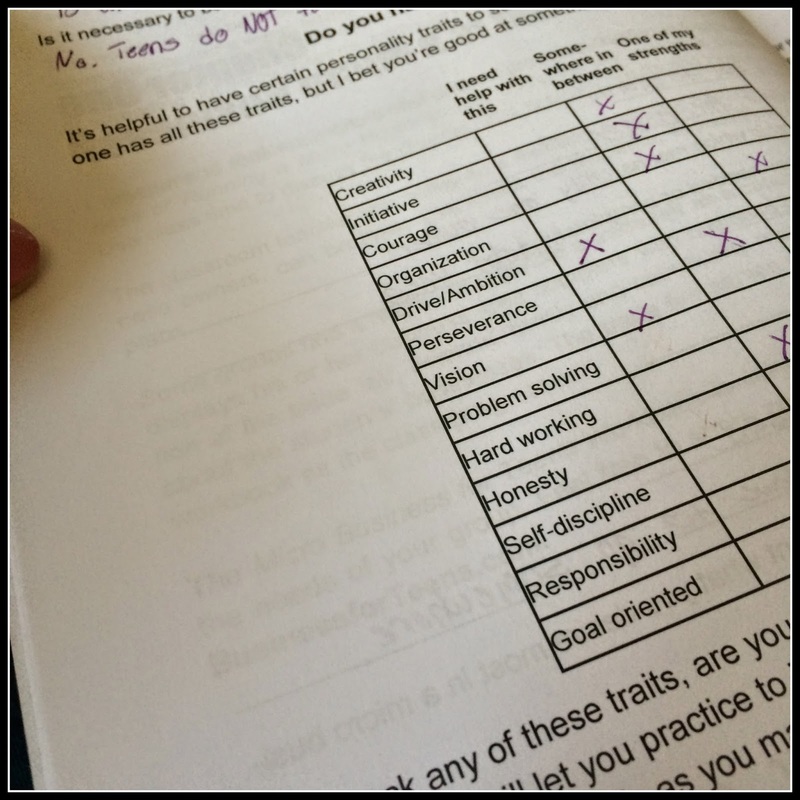 It was interesting to read her answers and see how she evaluated herself. She hasn't come to me with ideas for her own business before reading these books, but now she can see that she'd be a great babysitter, and photography is a possibility for the future. My younger daughter has a business mind, and has knitted several scarves with the hope of selling them to help fund her trip to Europe this summer with her youth choir. As we went through these books, we saw lots of ways to improve her business, as well as several mistakes we've made. For example, we haven't kept good track of how much money we've spent on the yarn for her scarves. We have a general idea how much a skein costs, and we price the scarves accordingly, but we haven't saved receipts or kept track of sales. We also haven't done any marketing. We have lots of room for improvement! Both my girls love to bake, and are considering ways to start a baking business. They would like to raise money for their youth group to pay for shipping Operation Christmas Child shoe boxes this year. They make me so proud. I am so grateful for this resource! It has shown my girls and me some great ideas for businesses they could start, and how to manage their money and time. If you have a teen who is looking for ways to make money, this is a great place to start. It offers simple, clear direction for you and your teen and their business. You can purchase Micro Business from Teens directly from their website. Thank you for the review! I really appreciate it. Your daughters' ideas sound great.